SHIMLA, the capital of Himachal Pradesh, and the erstwhile summer capital of India in the of the British, had accidental and humble beginnings in the mid nineteenth century. The Gurkhas, after a major debacle at the hands of the Sikhs in the Battle of Kangra in 1804, began to settle down in the hills around Shimla. The British then established a cantonment at Sabathu, near present day Shimla, around 1816, and the first "house" built was the log hut constructed for the Commandant. In 1821, the new garrison commander, Captain Charles Pratt Kennedy, built himself a more pretentious residence, which became the first permanent house of Shimla. The Captain was later entrusted control over all local hill matters and designated Deputy Superintendent of Sikh and Hill Affairs. Over time, Kennedy, an apparently hospitable man, had visitors to stay who, liking the place, built houses for themselves. By 1831, Shimla had become "the resort of the rich, the idle and the invalid" with upward of sixty houses scattered over the hills around. In 1827, Lord Amherst, the Governor General of India, spent the summer at Shimla after a tour of the North. His successor, Lord William Bentick, also repaired thither, after which the township became the summer headquarters of the Government of India. But the journey from the plains to the summer capital was tedious. The mode of travel was the "Jampan" - a sedan chair, fitted with curtains, slung on poles borne by bearers - or ponies, with luggage carried by coolies or mules. Besides the discomfort suffered by the travellers, the real torture was for the 15,000 local men who were requisitioned from their villages to haul the sahibs, mem sahibs and baba log up the hills for a pittance. The next step was to construct the "Grand Hindustan and Tibet Road" from Ambala in the plains through the hills so that wagon trains, drawn by bullocks or horses, could replace the human portage. The journey from Ambala to Shimla was in two parts, 70 kilometres in the plains to Kalka and then 96 kilometres up the hills. Kalka soon developed into a busy town on the foothills of the Shivalik Mountains, serving as a transit station for the journey to the hills. The Delhi Ambala Kalka Railway Company (DUK) constructed a railway line from Delhi to Kalka via Ambala during 1889 and 1890 and operations were commenced on March 1, 1891. The management of the line was entrusted to the East Indian Railway Company (EIR) who was able to register a net profit in the very first year of operation. The Government of India purchased the line in 1926 and transferred the management to the state controlled North Western Railway. After partition, this section became part of the newly formed East Punjab Railway and was amalgamated with the Northern Railway on April 14, 1952. The idea of a line to Shimla was first mooted in 1847 and the earliest survey was done in 1884. However, the Government and the DUK RAILWAY COMPANY signed the contract for construction only on June 29, 1898. The UNESCO has awarded the Heritage Status to this railway line. 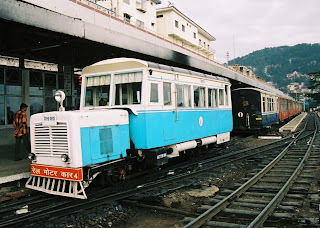 The 96.54 kilometre line, built on a 2 feet six inches gauge, was opened for traffic on November 9, 1903.Because of the high capital and maintenance cost, coupled with peculiar working conditions, the Kalka - Shimla Railway was allowed to charge fares that were higher than the prevailing tariffs on other lines. However, even this was not good enough to sustain the company and the Government had to purchase it on January 1, 1906. Spectacular scenery along the whole route, and the marvels of its construction, keeps the traveller on this line spell bound. On leaving Kalka, 656 meters above sea level, the railway enters the foothills and immediately commences its climb. KSR runs through 102 tunnels, some of which have hoary tales to tell. For instance, the longest tunnel at Barog, named after the engineer in charge of construction, bears the blood of its creator who apparently committed suicide after making a mistake in laying the alignment. This tunnel is 1143.61 meters long and remained the second longest tunnel on Indian Railways for a long time. It is a straight tunnel, passing through fissured sand stone. Another tunnel at Taradevi, cutting through a hill on the peak of which is a famous temple, tells of the local superstition of the day that the Goddess would never permit it's construction. When construction was half through, great excitement arose from reported sightings of a huge serpent in the tunnel that had emerged to stop the work. Anti climatically the reptile turned out to be a long iron pipe running along the tunnel to convey fresh air. The section has 864 bridges, only one of which is a 60 feet plate girder span and a steel truss. The others are viaducts with multi-arched galleries like the ancient Roman aqueducts. Bridge No. 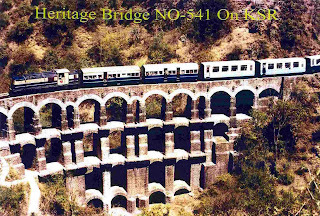 493, historically known as the "Arch Gallery", situated between Kandhaghat and Kanoh stations, is an arch bridge in three stages, constructed with stone masonry that stands good even today. Bridge No. 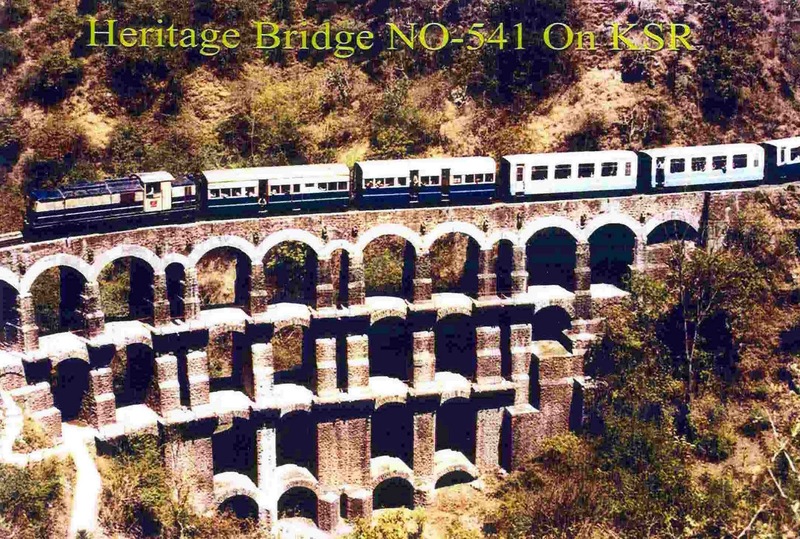 226, between Sonwara and Dharampur is an arch gallery bridge having 5 tier galleries of multiple spans, constructed with stone masonry and bridging a deep valley surrounded by high peaks. The railway has a ruling gradient of 1 in 25 with 919 curves, the sharpest being 48 degrees. Climbing from 656 meters, the line ends at 2076 meters at Shimla. Another famous hill station in the area is Chail. Piqued by British snobbery, the Maharajah of Patiala built his summer capital here as a rival to Shimla. Accessible from Kandhaghat or Shimla, Chail is at a height of 2150 meters. The Maharaja's Palace, built in the 19th Century, together with the Cottages of his staff are today a beautiful holiday resort. Chail boasts of the highest cricket ground of the world, over looking the Sutlej Valley, with a spectacular view of snow capped Himalayan ranges. Today Northern Railway offers several options for travel between Kalka and Shimla. A Shatabdi type Super fast luxury Express train, called the Shivalik Deluxe leaves Kalka every morning at 05:30 hours, reaching Shimla at 1015 hours. 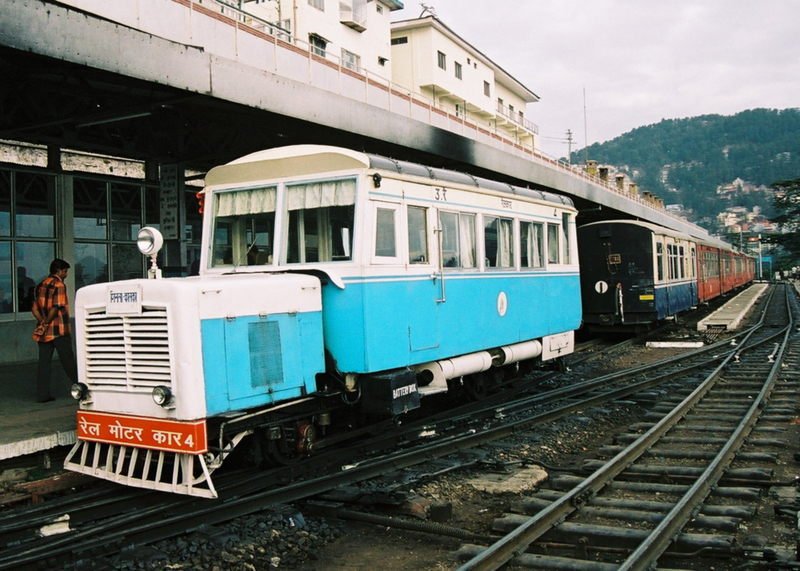 On the return journey, it departs Shimla at 17:30 hours, arriving Kalka at 22:15 hours. Breakfast on the outward journey and dinner on the return are provided as part of the fare. The train connects the Howrah - Delhi - Kalka Mail. During the holiday season, from May 1 to July 15, September 15 to October 30 and December 15 to January 15, a Rail Motor Car leaves Kalka at 11:35 hours to reach Shimla at 15:40 hours. On the return journey, it leaves Shimla at 11:30 hours to arrive Kalka at 16:20 hours. The Rail Motor Car connects the New Delhi - Chandigarh - Kalka Himalayan Queen Express.